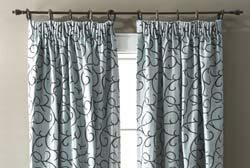 We offer the following types of Window Treatments, and can custom make almost any size or style you'd like in all of these fabrics. 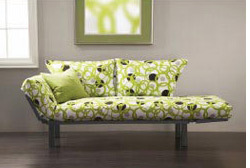 We can provide the products, design assistance, and Fabric Samples to enable you to coordinate any bedroom, living room, office, or den, with matching Futon Covers, Bedding Sets, Duvet Covers, & Accessories, Daybed Covers, and Accent Furniture, consisting of Pillows, Jazz Loungers, Slip Covered Chairs, Nesting Ottomans, and Bean Bags. 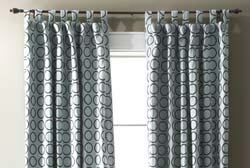 Rod Pocket Valances are a great window accent, and are always in style. 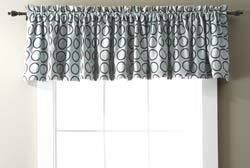 They measure 102" Wide and 16" Long, and fit any window 30" to 60" Wide They also come in a Tab Valance style, and may be combined with Panels. 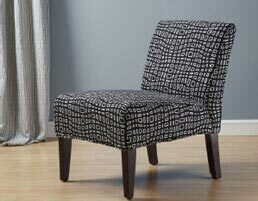 Tab Panels give any room a casual and comfortable look. These panels are sold individually, and measure 50" Wide by 84" Long. They will fit widows measuring 30" to 60" Wide. Pencil Pleated Panels have pencil sized pleats at the top, and are also sold individually. They measure 50" Wide by 84" Long, and fit windows from 30" to 60" Wide. 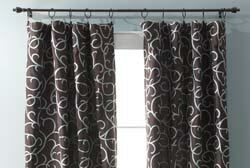 Rod Pocket Panels are practical, and look great in any room. They are sold individually, and measure 50" Wide by 84" Long. They will fit windows 30" to 60" Wide. Flat Panels are just what they sound like. 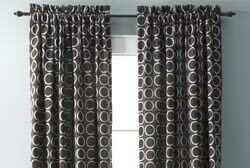 They are flat pieces of fabric, with holes in the top for your curtain rings. You can bunch them up a little or a lot. 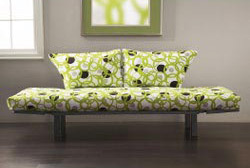 They are also sold individually, and measure 50" Wide by 84" Long. 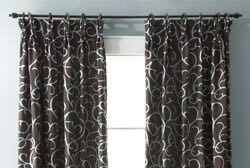 Pinch Pleat Panels are also sold individually and measure the same 50" Wide X 84" Long. They will also fit window openings from 30" Wide to 60" Wide. The Jazz Lounger is a multi-purpose highly functional piece of furniture that is ideal for a kids room college dorm room, office, or studio apartment, or anywhere that you'd like to have a fashionable and comfortable 2 seat sofa, which quickly and easily converts to a lounge for watching TV or reading a good book, and then fully converts into a bed to accommodate an extra guest. The frame is made of a sturdy 18 gauge steel with a black powder coated finish, and has a 1 year warranty. In the Sofa Position with both arms up it is 55" Wide, 32" Deep, and 24" Tall. The mattress itself is 32" Wide, by 80" Long, and 5" Thick, and is filled with alternating layers of garneted cotton, and high density foam. 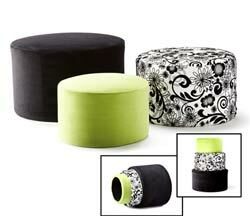 The outer shell can be ordered in most any fabric, and is then tufted in place with nylon Jiffy Tufts. Ordered that way, the original covering can not be removed, but you can order additional covers for the main cushion, and the Back Pillows if you ever need them in the future. When the Jazz Lounger is flat, it's 80" Wide, by 32" Deep, and 24" Tall. You can order the Jazz Lounger Mattress in a plain natural color, and can then order a removable zippered cover for the mattress and the 2 back pillows. You can also upgrade the mattress, however you can not use too thick of a mattress or it will not be flexible enough to make the sofa position with the arms straight up. Instead it will want to stay in kind of a V Shape. Plush Guards - To protect your Mattress, we highly recommend purchasing one of our Plush Guard Mattress Protectors. For conventional Bed Mattresses they are a fitted sheet style, with a terry cloth like material on the outside, with an inner lining which is waterproof, and dust mite, and bed bug bite proof. BedGuard Encasements - This item completely encompasses your entire mattress. It is more like a T-Shirt type of material on the outside, and also has a waterproof, as well as dust, and bug proof inner lining. Non Slip Gripper Pads - Non slip mats come in many different styles and sizes, and are made of several different materials, or variations of materials. 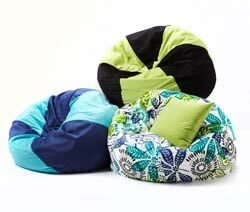 They are multi-purpose and can be used to keep a futon mattress from slipping off of the futon frame, or to keep throw rugs from slipping, or for hundreds of other uses. If you have any questions about this or any of our great products, please don't hesitate to call us or E-mail us at sales@futons.net We're here to help.